Boston Organics has started a new series of posts for Meatless Monday recipes in order to offer ideas for vegetarian dinners and also to encourage a reduction in weekly meat consumption. This encourages a more sustainable lifestyle. Meatless Mondays are a way to show our customers that vegetable-based meals can be hearty and delicious and that they are a nutritious and environmentally responsible way to eat. 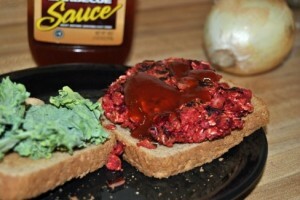 This week’s featured recipe is for BBQ Beet Burgers. 2. Chill mixture for at least 30 minutes. 3. Using your hands, form patties (about 3 inches in diameter). Place patties 2 at a time in a lightly oiled skillet over medium-high heat. Cook for 4 minutes on each side, or until the patty begins to brown. Flip and repeat. 4. Serve over toasted bread or hamburger buns, topped with kale and BBQ Sauce.